Buses await students at York Middle School in York, Maine, 2017. School districts in Maine are in desperate need of bus drivers. The problem is particularly serious in some rural communities, where custodians and office assistants are being asked to get behind the wheel, and some districts are trying to avert a crisis. Here in the bus garage inside the Oxford Hills School District, Transportation Director Dave Fontaine looks out on a parking lot full of buses, all waiting to be serviced. "We've got those four, and we've probably got another six in the backyard that aren't road-ready right now," he says. "Because they're waiting for something, because we just haven't had a chance." The district has nearly half-a-dozen staffers to maintain its fleet of vans and buses. But this year Fontaine says they've all been called to another duty. On some afternoons, he says, almost the entire transportation department, including him and his office assistant, are out driving the busses. 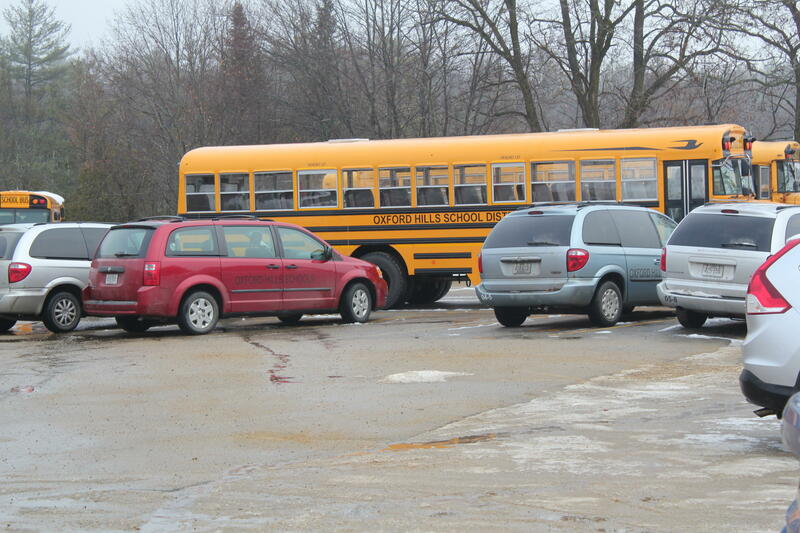 Nearly a dozen school buses in need of repair sit on a parking lot in the Oxford Hills School District. The school's mechanics have been working as bus drivers in the face of a shortage, leaving a backlog of maintenance work in the district. "We actually had one day this fall where we had to call up residents of West Paris and ask them to pick up their own kids at school," he says. "We just didn't have a driver that afternoon. We were so short". Oxford Hills, like several districts around the state, is dealing with a bus driver shortage of crisis proportions. A spokesperson for the Maine Department of Education says the agency doesn't track the numbers of bus driver openings statewide, but the education job website ServingSchools.org, lists 54 openings in Maine. 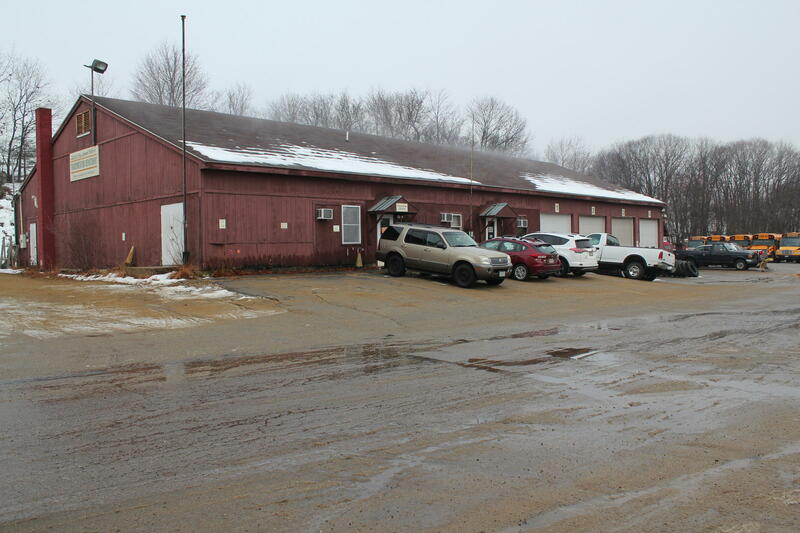 One school official in Androscoggin County said that when he contacted five nearby districts, they were collectively short more than 30 drivers. Some observers say the reason for the shortage is national in scope. "It's a function of the economy. It's a healthy economy, but doesn't work so well for some of these positions," says Dan Chuhta, the superintendent of SAD 75 in Topsham. Chuhta says many bus driving positions are part-time, and require early shifts. Drivers need to take a written test, earn a permit, then accrue 40 hours of on-the-job training. Many districts provide staff and buses to teach future drivers, but the whole process can take months, which officials say can discourage applicants. SAD 52, which covers Turner, Leeds and Greene in rural northern Androscoggin County, was down seven drivers earlier this fall. That's more than one quarter of the entire bus fleet. Transportation Director Dan Labrie says that on some days, he was forced to hand out maps and route sheets to custodians who relied on students to help them find their houses. Almost the entire staff of the transportation department at the Oxford Hills School District has begun driving buses in the wake of a shortage of drivers within the district. "Some mornings, if we didn't have someone physically driving that bus route, just cutting that bus route on the fly," he says. "Calling bus drivers on the radio. Saying, 'You've gotta pick up this road, this bus driver will pick up that road,’ at a moment's notice. A maintenance worker, a custodian, anyone who had a license was getting in a bus for me." Labrie says the district nearly resorted to "double-runs." That's when a driver picks up a bus-full of kids, drops them off at school, then leaves again and picks up more kids for another route, which might get them to school more than an hour late. The district managed to avoid this worst-case scenario by launching an advertising blitz, putting up yard signs across the district. It got results; Labrie says most of the vacancies have since been filled. "If things do go awry, I've got staff in place to address that," Labrie says. "We can still get students to school in a timely manner." Other districts have resorted to offering sign-on bonuses of up to $1,500 to entice new drivers. The York School Department, meanwhile has proposed a new, "cluster stop system" in which students walk to bus stops instead of being picked up right at their door. Parents pushed back on the plan, though, and it's since been put on hold. Back at Oxford Hills High School, Fontaine says his department has been turning to a solution that has kept the bus driver crisis manageable. Three years ago, Fontaine helped launch a "walking school bus" at Guy E. Rowe Elementary School, which is located centrally in the town of Norway. Under this system, volunteers guide dozens of students across town on foot, and they walk to school together, even on cold winter days. Fontaine says without that program "we'd be down one more driver. Which would probably mean, that'd be me driving every day doing that Norway run. We're almost at that right now. I'm the next backup driver, every time." The walking school bus is also used in Portland. Labrie says while the program may help in urban areas, it'd be impossible in most of rural Maine. “I mean, short of just this one street out in front of this building," Labrie says. "Otherwise, after that, you're dealing with a 55 mile-an-hour speed limit, dealing with the road right out of here. It just wouldn't work over here." Labrie says that means his district, and other rural schools, will need to keep scouting for and training new drivers, just to make sure the shortage doesn't get any worse. Updated Dec. 6, 2018 at 4:45 p.m.
Cape Elizabeth High School became the latest school in the state to pull out of the federal school lunch program last week. District officials say the decision was made due to federal guidelines that it feels are too stringent.